A series of kiln-fired porcelain, bent wood and cast iron sculptures by New York-based artist Arlene Shechet will adorn the drained reflecting pool in the north of Madison Square Park. Shechet’s public art show, titled Round and Round, will be on view from September 14 to April 28, 2019. The name Round and Round is analogous of the circular shape of the reflecting pond, which is the site for the art pieces. It also refers to the flow of informal conversation Shechet hopes to inspire in the audience. By adding seats and crafting the park’s environment, Shechet wishes to create a gathering place in the nature that encourages interactions between people. 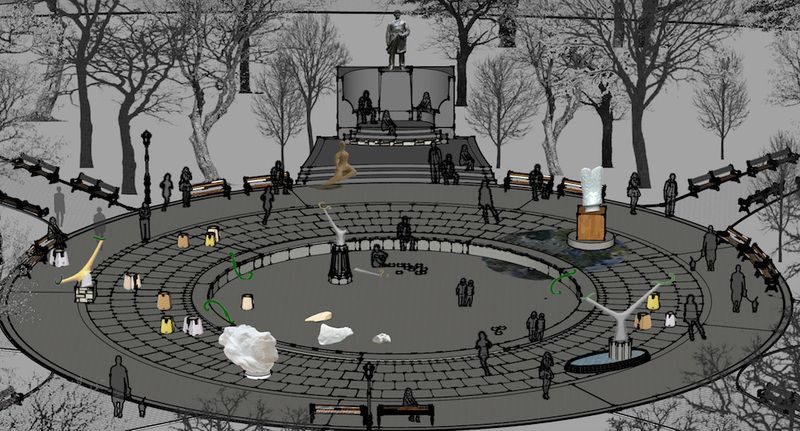 The artist’s first site-specific, public art project will transform the emptied pond into an outdoor amphitheater with elaborate sculptures and urban furniture. Informed by her fascination with 18th century decorative arts, her statues will explore motifs such as lions and birds. She also responds to existing objects in the park, such as the Admiral David Glasgow Garragut Monument. Arlene Shechet is a sculptor based in New York City and the Hudson Valley who experiments with different materials, including plaster, paper and clay, and reflects on ideas like chance and elements of Zen Buddhist thinking. She recently exhibited at the Phillips Collection in Washington, D.C. and the Institute of Contemporary Art in Boston.